Cover Order Buying on Options: Launch! Finally! With the Union Budget passed last week, we can expect a good amount of volatility ahead as the markets get prepared for implementation of changes laid out by the Finance Minister. And, to facilitate your trading decisions, we have decided to offer the facility of Cover Order Buying on Options! In case you want to know what Covers Orders are, here is an excellent introduction. Introduction to Cover Orders In February, we launched Cover Orders for Options Selling. Starting Wednesday, 16th July, we are launching Cover Orders for Options Buying. Here are the details. Leverage is obviously very important for day traders. On Cover Order Option Buys, RKSV will provide 1.33x leverage. That means that with the help of the Cover Order facility, when buying a Cover Order Option, you will receive 1.33 times leverage on your trades. Another way to think of this is that you only need to pay 75% of the original premium value. 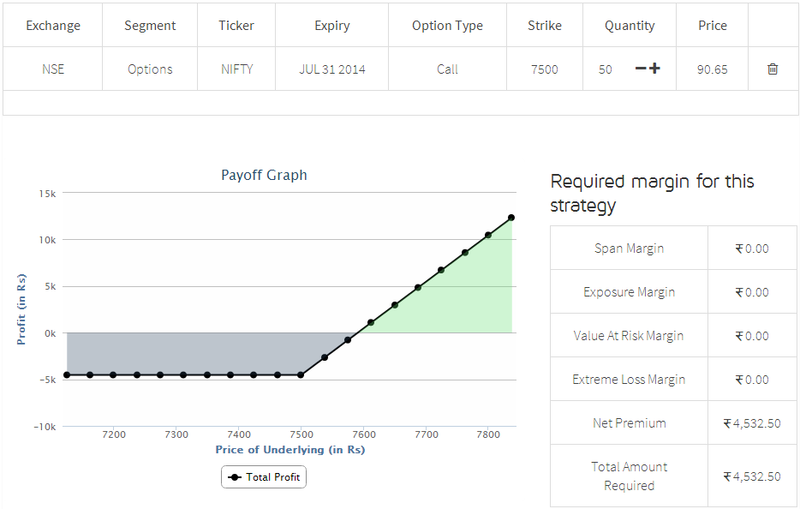 Scenario: Suppose you are looking to place a buy on 1 lot of Nifty Options Call at a strike of 7500 at a price of Rs. 90.65. Using the RKSV Options Strategy Builder Tool, we can see that without cover orders we would need approximately Rs. 4532.50 to place the trade. Here's an image that shows this. However, by using the Cover Order Buying facility, the margin required would be 75% of the total Premium amount. Therefore, the margin required would be reduced to (Premium x lot size) * (75 %) = (Rs. 90.65 x 50 x 75%) = Rs. 3399.38 Not only do you get the accompanying stop loss benefit that accompanies cover orders, but you also get margin benefits. How is that for a win-win situation? The stop loss range for Cover Orders (both buying and selling) is 20%. This means that if the price of the Option (Premium price) is Rs. 90, your stop loss range is from Rs. 72 to Rs. 108.